Walk into any warehouse or manufacturing facility, and you’ll encounter one of the critical components of the material handling industry, pallet rack storage systems. 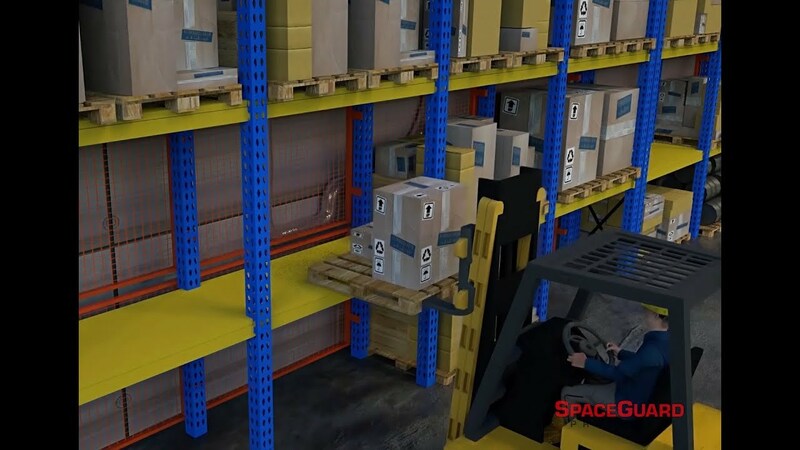 Though they vary in type and design, all pallet rack systems are used to keep products organized and to provide additional storage space by working vertically. Warehouse rack guarding systems are designed to prevent products from falling off a bay of racking and landing on a passerby. Brackets allow for varying offsets and systems can be designed to go above the uppermost bay, ensuring proper coverage and safety. This hard guarding provides a hard stop for stored materials, unlike industrial netting which is designed to catch materials. The steel mesh also prevents sharp or unbalanced loads from falling through. Wire mesh rack safety systems can also keep your company NFPA compliant. By attaching steel mesh panels to the inside of back-to-back uprights, the panels keep the flue space open allowing flames to vent up rather than out creating a vertical rise helping to slow down the horizontal spread. Sprinklers can reach burning material without obstruction. Wire mesh panels and doors can also be configured to fully enclose bays of rack. Pallet rack enclosures provide controlled access to high-cost items as well as combustible or otherwise hazardous materials. BeastWire Rack Safety Panels are found in almost any warehouse using a pallet rack system to store products and inventory. Our panels are constructed of 10-gauge or heavier-duty 6-gauge wire welded in a 2” square mesh pattern and welded securely into a 1-1/4” x 1/8” thick full angle frame—providing the ultimate strength and durability. The BeastWire rack panels attach to the existing uprights with either our patent-pending Grrripper Bracket or the innovative L-shaped and Sleeve brackets. The BeastWire Grrripper Bracket (Patent Pending) is the world’s first and only drop-in bracket. The pin drops into a tear-drop upright and won’t disengage from the rack upon impact when it’s installed correctly. The Grrripper Bracket saves on install time and money. With the L-shaped brackets, offsets can be adjusted in the field using various pre-punched holes. The sleeve brackets use a U-shaped bolt which is designed to go around an upright; a great option when attaching to an upright is not allowed. Multiple bracket types ensure that BeastWire Rack Safety Panels will attach to all uprights. 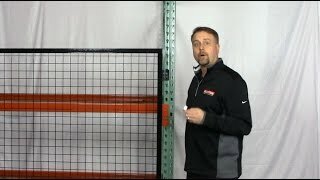 BeastWire Warehouse Rack Safety Guarding Panels are preferred over most netting because it provides a definite stop to keep unit loads or stray boxes from falling below or into the flu space between uprights. Unlike plastic netting or nylon mesh—which are flexible by nature, BeastWire’s welded wire mesh design, won’t allow sharp objects to damage or cut through the wire providing a more secure guarding and NFPA compliant solution. Add another level of security to the front of pallet racking and thwart off theft by using a bi-parting hinge door which attaches directly to the pallet rack uprights. Pivot brackets are available in single mount or double-pin (shared) when used between two adjacent doors. All doors come equipped with padlock hasp and install in minutes. Slide doors which use an independent post system are also available when aisle space is limited, or additional locking mechanisms or strikes are required. Panels can be supplied to protect the ends/sides of pallet racking and attach with basic angle clips. What can your operation do to keep your facility/warehouse operating at top efficiency while keeping your workers safe from falling objects, helping you stay NFPA compliant, and preventing facility structure damage? 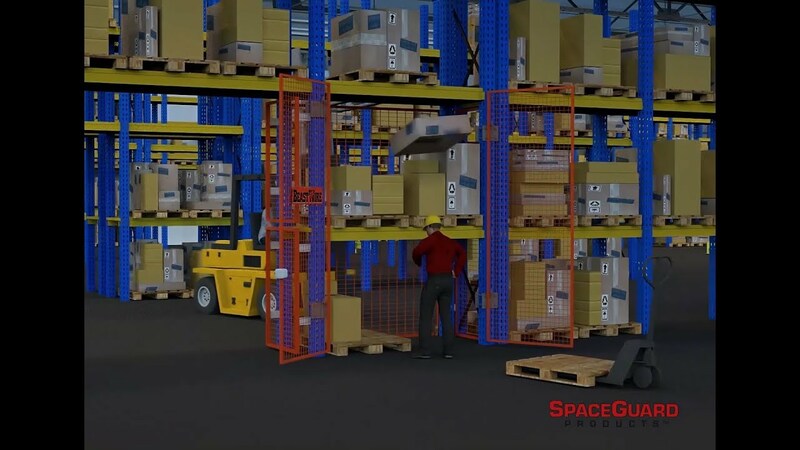 SpaceGuard Products BeastWire Rack Guarding system, with its 4 styles of brackets, will provide secure storage while keeping facility accidents down. 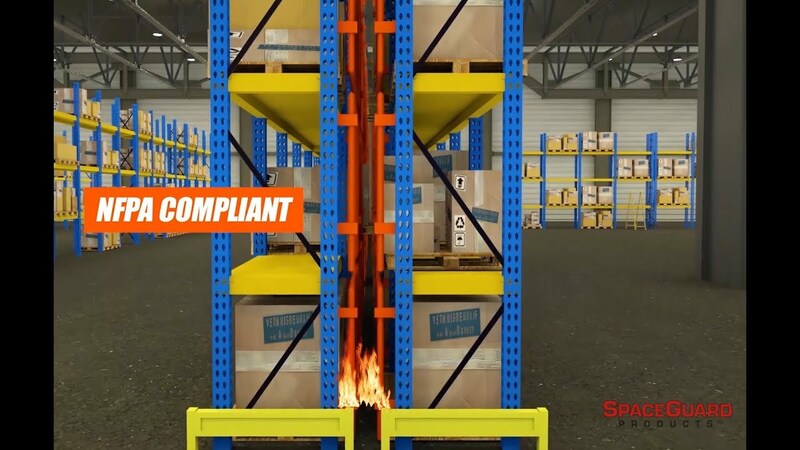 In these videos, learn how to prevent common workplace accidents, avoid facility and warehouse structural damage, and avert costly fire damage while staying NFPA (National Fire Protection Association) Compliant. BeastWire has revolutionized the Rack Guarding Industry with our patented Drop-in Grrripper Bracket for teardrop rack uprights. The Grrripper Bracket is safe to use and with its multiple offsets provides easy and fast installation—saving you time and ultimately, making you more money. 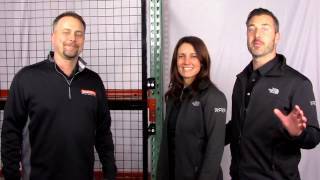 Check out these training videos and see for yourself how easy it is to use the Grrripper Bracket. BeastWire Warehouse Rack Safety Panels work with your current storage racking system, not against it. These mesh panels prevent costly damage and injuries due to falling objects or structural impact from forklifts. Framed or unframed welded wire mesh panels can be used between continuous bays that share a common upright. They can also be connected to the row ends of the pallet rack to create side enclosures. Note that our standard framed BeastWire Mesh panels are typically bolted, while the unframed mesh is often screwed to the upright, and therefore offers greater security. Always check with your pallet rack provider prior to screwing or drilling into any structural support as it may affect its engineered performance. For more information on industrial rack manufacturers worldwide, visit the MHI Rack Manufacturers Institute. 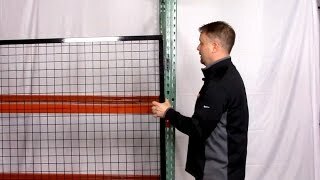 BeastWire Mesh rack security doors are great for the storage of high theft or combustible products on selective pallet rack. BeastWire rack doors mount directly to the uprights as a cost-effective means to avoid purchasing independent doorposts. BeastWire Mesh rack doors are typically bi-parting to cover beam lengths of 6’ to 12’, although single doors are available for smaller 4’ bays. Constructed similar to the panels, but with flat steel, stock welded diagonally for additional rigidity. Doors are punched to accept bolt-on padlock hasps (provided) and are furnished with threaded rod ends to connect to pivot style brackets. BeastWire Mesh pallet rack enclosures can alternately use slide gates if there is ample room for the doors to travel open. Our slide doors are often mounted on alternate sides of an independent post system that sits in front of the pallet rack uprights with one door sliding on the inside of the posts while the door on the adjacent bay slides in front. It should be noted that slide doors require an overhead box track which typically extends 6” above the door. Therefore, we do not recommend slide gates when storage levels above the door are required as door tracks can be damaged beyond repair. The BeastWire Grrripper Bracket (Patent Pending) is the world’s first and only drop-in bracket. These brackets are compatible with the most common style of selective pallet rack: teardrop slotted uprights. The Grrripper Bracket allows for a safer method of attachment for installers handling the steel mesh panels at extended heights while installing more than 80% faster than any other bracket on the market. The Grrripper bracket uses a proprietary drop pin that ensures the system will not disengage from the rack when installed correctly. This means the BeastWire Grrripper bracket is not only the easiest rack safety bracket but the safest bracket on the market. The Grrripper bracket is currently available in 3 different sizes: 1” to 3”, 4” to 6”, and 8” to 12” offsets. BeastWire Mesh panels are constructed of wire mesh or other steel infill material welded securely into a 1-1/4" x 1/8' thick angle frame. Panels come standard in one-foot increments up to 10' wide and 5' high, but due to BeastWire’s universal hole pattern can be stood straight up as well and still bolt to the posts. Panels serve primarily as back and side protection to your rack but can also be connected as tops for a full rack enclosure. 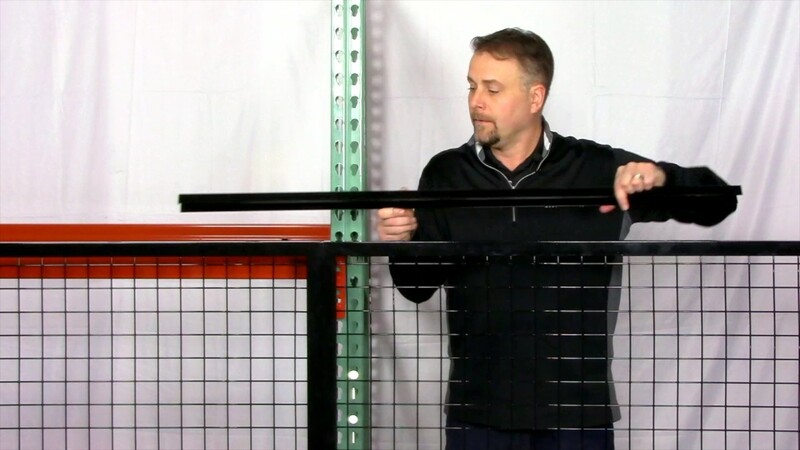 BeastWire Mesh rack safety panels are only constructed in widths up to 10’, but have no fear, they can guard larger widths between rack uprights by bolting multiple panels together. For example, a 12’ wide bay with 10’ high of rack safety coverage could be achieved with (2) 8’ wide by 5’ high panels stacked atop one another with a 4’ x 10’ panel stood on end and bolted to the other two panels. Our panel splice channel is available to create additional support at these panel seams. 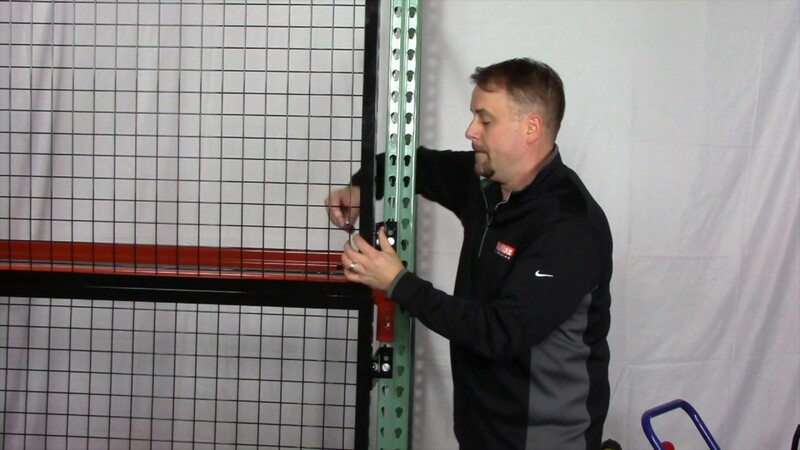 Bolt-on rack safety panel brackets are available for upright styles other than a teardrop, such as slotted and structural uprights where the bolts are used in place of the drop-in rivets on the BeastWire Mesh Grrripper brackets (make sure to link to that section). Bolt-on brackets are available in 3” to 6” and 8” to 12” styles. Our fixed, flush-mount bracket is also available when pallet overhang is not required. The flush mount brackets are popular for pushback rack systems and pallet rack security enclosures for higher security for side and back guarding. Bolt-on Adjustable- Offset(s) 3" to 6" and 8" to 12"